Last Saturday, I decided to cook Sweet and Sour Pork Ribs. It is quite a simple dish to cook. In fact, the sweet and sour sauce can be used for many types of meat eg. pork balls, fried fish and even chicken fillet. 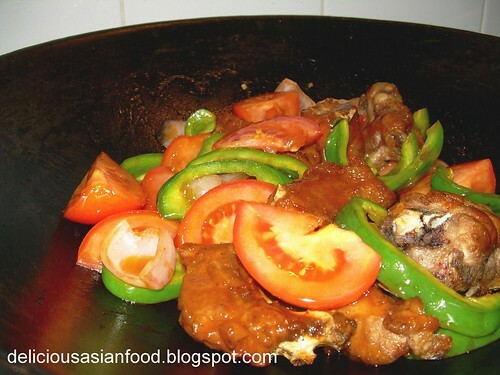 This is my recipe for Sweet and Sour Pork Ribs. Marinade pork ribs for about 3 hours or more. Adjust amount of salt as marinade according to your preference. Deep fry the pork ribs till golden brown and cooked. Remove and drain. Add 1 tablespoon of cooking oil into wok at high heat. Fry onions and capsicums for 30 seconds. Add tomato ketchup. Sprinkle sugar to taste (depending how sweet or sour you want the sauce to be). Gradually add a little warm water depending on how thin you want the sauce to be. Finally, add the tomatoes and fried pork ribs. Stir and coat the pork ribs in the sauce and serve hot. Excellent served with Egg Fried Rice. You can also add cucumbers (diced) or pineapples (diced) into the dish. Thanks for the recipe. It seems not too difficult to make. I guess I will try it with white fish soon… Nice pic by the way. I love this dish!! normally I’ll add a bit of vinegar to make the sauce a bit more sour. hehe..